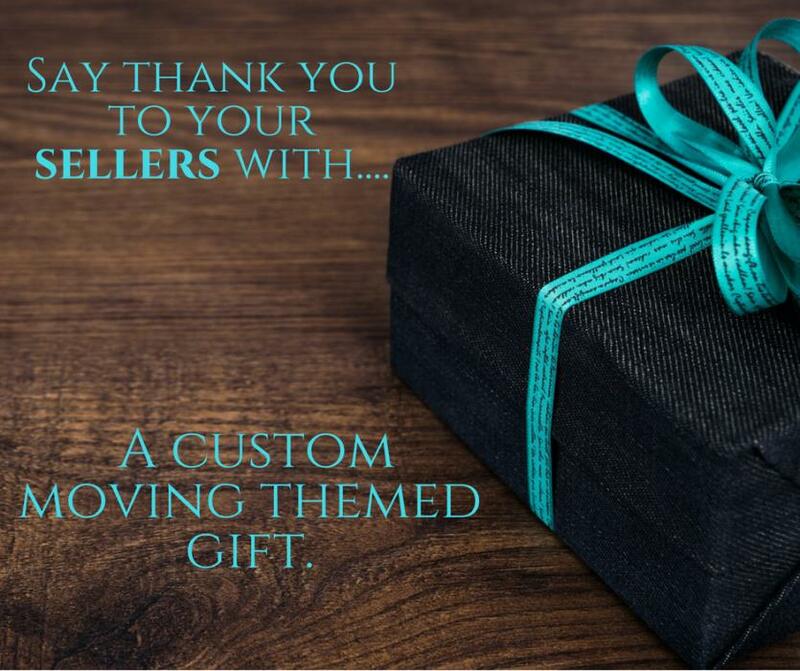 Get more referrals and repeat customers with personalized moving themed gift for your closed sellers. What better way to say thank you to a seller then with a custom gift of moving must haves! With this listing: - I will work with you to determine and appropriate budget for the gift. - I will locate the perfect items to include. - I will send you a detailed list of each items cost, and where to find it. - I ask for a 3-4 business day turnaround. Gift contents may include: - Several branded items such as Coffee Mugs, Pens, Tote Bags, Blankets or more with your logo. - Moving must haves such as Tape, Tissue, Bubble Wrap, Markers, Boxes and more - Gift Certificate to the local pizza place for moving day - Gift Certificate to a chain store such as Target to purchase last minute moving essentials - Movie Tickets or Tickets for a fun night out - Local Favorite Snacks ( Local Baked Goods, etc) - A pretty gift box or tower of boxes for contents to be wrapped in. - As well as other moving must haves. Other Info: - Contents can be customized for each seller if you prefer. - This listing is for a research fee. If you would like to be hands off and have the gift RESEARCHED / FOUND AND DELIVERED to the client, I can also help with this. Please MESSAGE ME. I will Purchase all items, Pack them and ship them directly to the client for $35 + Retail value of items and Shipping. - If you would like, I can do this on a regular basis for you for the one time research fee + $35 for each client you have. All you would have to do is email me your clients information! - After purchase of this listing I will be in contact with you to discuss what you specifically have in mind. This will be a 5-10 minute phone call. Let's get you referrals and repeat business!